Images provided to News 4 show dozens, if not hundreds, of bags piled underneath a terminal ramp alongside snow piles on Tuesday afternoon, more than five days after the airport shut down for the day amid last week's blizzard conditions. The closure set off days of overcrowding following the airport's reopening that was compounded by a pair of planes that clipped wings and a burst pipe that flooded the privately operated Terminal 4 over the weekend. 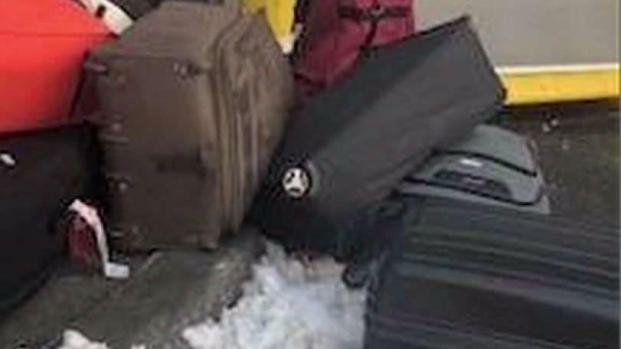 Chopper 4 footage from over Terminal 4 at the airport Tuesday also showed piles of luggage being held outside amid the snow. If you left John F. Kennedy International Airport without your baggage during last weekend's weather-related meltdown, there's a chance it might be sitting outside, underneath a ramp. Andrew Siff reports. 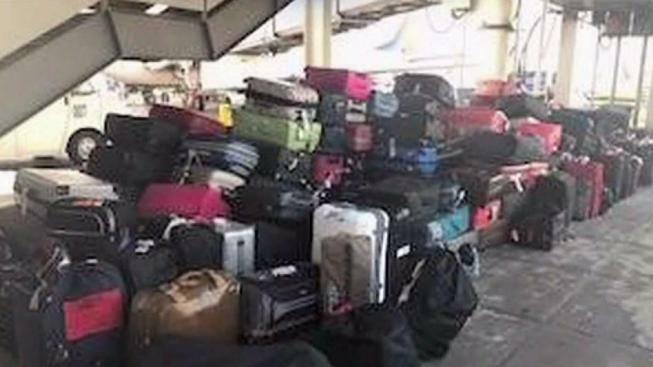 Airport sources told News 4 that Port Authority managers instructed ramp supervisors to remove bags that piled up over the weekend and stick them under the ramps so passengers would not see piles of luggage. The images provided to News 4 were taken earlier in the day Tuesday. The sources added that the terminal operator was issued summonses for improperly storing baggage. A Port Authority spokeswoman reiterated that the agency had directed airlines to immediately return all bags to customers who were impacted by the weekend's events and that bags are sometimes temporarily placed under outdoor ramps. "In the process of returning baggage to customers and as baggage comes in from other airports from rerouted flights, and for passengers transferring to other flights, airlines temporary place and sort bags at various points in the airport including the outside ramps," the spokeswoman said. "These are not storage areas." And a spokeswoman for JFKIAT, the owner of Terminal 4, told News 4 Tuesday evening that "T4 has made significant progress returning bags to passengers and has been working to increase personnel and manpower with airlines and delivery services to do so." But it's not appeasing the thousands of travelers who are still trying to track down baggage they could not claim during the weekend's conundrum. On Tuesday, Peter Wyngaard told News 4 he and his fiancee lost their bags while making a connection from Detroit to Paris the same day the water pipe burst. He said they made it to France nonetheless, but their airline still doesn't know where their bags are. Another couple, Jeff Loria and Amy Litchenfeld, said they found out on Tuesday that their bags lost when their flight to Colombia was canceled actually made it to Bogota. But they don't know how they'll get them, since they won't be making the trip anymore. "It's complete frustration at this point," said Loria. Others reported waiting for hours for luggage, only to see their flight numbers disappear from baggage claim boards. At least one NBC employee who arrived at the airport early Sunday said that an airport employee handed out pieces of paper for passengers to file a report and were told to leave a message on a voicemail inbox that was already full. Another traveler, Rosemary Owuo, told News 4 she was told to leave her luggage at the terminal after Sunday's chaos, and airport employees told her she'd have to wait two weeks to get them back. Images show dozens, if not hundreds, of bags sitting outside in the snow at JFK Airport. Andrew Siff reports. "I couldn't wait two weeks," she said. "There are important things in the bags." International airlines have committed to have baggage reunited by passengers in New York City by Tuesday morning, said Port Authority Executive Director Rick Cotton on Monday. But passengers Tuesday weren't convinced. "We are stunned by the lack of leadership by the Port Authority and the airlines," he told News 4 over Skype. "Why are they not showing up and personally help lead the charge?" "It just seems like there's very little effort taking the bags back," said Loria. "No one is taking responsibility for the back not being back at this point."